descends briefly, leaving me in a tangled heap on the floor, tears hot on my cheeks. I fantasize about cutting a tiny X on my ankle, mostly just to feel the purity of the pain. I resist. Even on a dark day I realize that some doors need to remain firmly closed. Eventually, I stand up and walk slowly from room to room, one foot in front of the other. I pick up a toy, start a load of laundry, wash a dish, tidy the pile of music in the front room. I'm listless, but I begin to catch momentum. Then an email sets me off and I collapse again, wrapping my arms around my gut to embrace the stab of utter uselessness. Part of me stands apart, shaking my head at the silly dramatics that no one else sees in the empty house. Years ago, on another day like this, I called home, needing my father's usual wisdom and comforting words. But Daddy answered the phone in a bad mood, and I hung up quickly, feeling defensive and cheated. Prayer feels like that this week. God hears; I'm sure of it. But He declines to answer, busy with more important things than my petty mood, or accurately recognizing that I can muddle through just fine on my own and need the experience anyway. I will agree with God tomorrow, probably even pulling some profound tidbit from the process. Today, though, I feel abandoned, my faith buried under cynicism. Evening wallowing loses its charm after a while, so I exercise. For an hour or so, I can outrun or out bike the melancholy. As my legs pump and my heart beats, I feel strong. Endorphins push the gloom away, and I rise to the surface to take a deep breath. Before long, I'll float to the top for good. By the time you read this, in fact, today's cynicism and gasping sobs will have faded into a memory of a day that I let the world win. I hope I keep the memory, though, hope that in some way I can imagine these hours of melancholy stretching on for days or weeks. Then perhaps when I come across a friend buried under the waves, the heart that feels like stone now will find the empathy that I need to stretch out a hand. Perhaps I will stand on someone's porch, like a friend did for me today, not so much saying the words that needed to be said but offering a small patch of settled ground to help me gain my balance. Dodging the clinical depression bullet is DEFINITELY something about which to feel fortunate. However, one (small but significant) blessing that I've found from having "done time" in months of seemingly hopeless sadness? 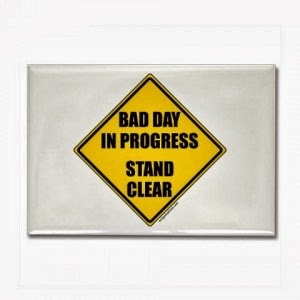 When a bad day comes along, as one did for me on Wednesday, being able to wake up on Thursday to find that the world (while still far from ideal) doesn't continue to be the dark place that it seemed before? It feels like Christmas morning, no joke. So, there's that. And you're right, being able to empathize is no small blessing either. Hope you're feeling better, or that you do soon. I appreciate very much those who are able to empathize when the dark days come. Hope are feeling better. I appreciate here the wisdom that experience can bring, such as feeling the despair and isolation life can bring but knowing that it will fade and better things will be ahead. I think that is one of the greatest blessings of maturity and what gives us more peace as we grow into, well.. grownups! We've seen storms and felt crushed, but we've lived in the sunshine, too.